February 2019 – Exclamation Points! 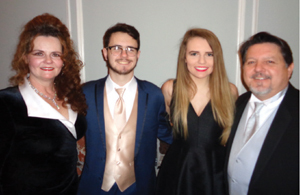 My Valentines: Kolton, Kassidi and Tim Kaminski at the Sugar Land Cultural Arts Foundation Platinum Jubilee. It’s February in Fort Bend and that means the best holiday ever – Valentine’s Day! Valentine’s Day means different things to different people. Ever since I had children, Valentine’s Day has meant celebrating our family with chocolate and flowers and giant stuffed animals and everything in between. Some day my grown babies may roll their eyes at me when I ship boxes to them filled with a plethora of heart-felt items on Valentine’s Day, but it hasn’t happened yet! If you need help coming up with some heart-felt ideas for your Valentine, check out the 10 tips on page 22 and our Love Is In the Air Gift Guide. You’ll find some great ideas make your sweetheart feel special. Speaking of feeling special, that’s exactly what Sugar Land Face and Body Plastic Surgery and Dr. Eric Humble is dedicated to doing: making each patient look and feel their very best. That’s very special in my book. Read all about Dr. Humble and his amazing medical spa in Sugar Land. Here’s wishing you a Valentine’s Day filled with a love that’s much more than love. Happy Valentine’s Day!